The truth is, many clinics that market egg freezing have a laboratory that has never successfully frozen and warmed a single human egg, let alone done it enough to refine their processes. Thus, we consider it a first order issue to assess the laboratory. First, your clinic must prove to you that they have deep experience both freezing and warming eggs within their own laboratory’s four walls. Being excellent at one, but not the other, is insufficient. And no, other laboratory’s results or “industry wide data” are not a proxy for how well your clinic’s laboratory will perform. There are a few ways to probe on this. 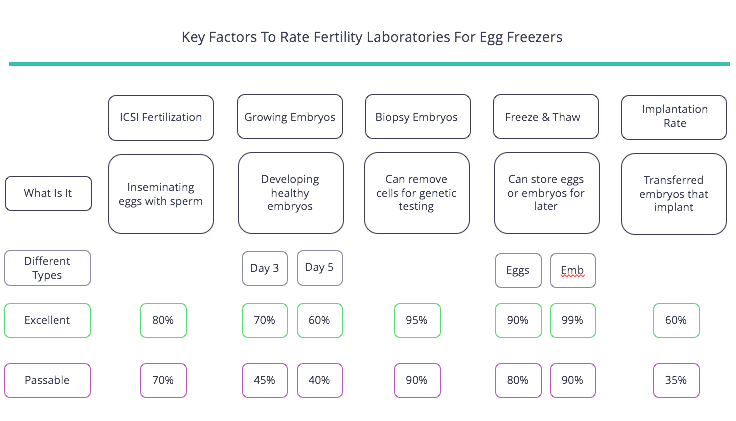 First and foremost, when you select a clinic you should ask for their “oocyte cryosurvival rate.” This is the percentage of frozen eggs that survive when a laboratory tries to warm them. We suggest you get this data for eggs the clinic has both frozen and warmed themselves. A passable clinic’s score will be around 80% and superior score will be about 90% or higher. A quick note: this number is measured over a large number of patient’s eggs. It’s distinctly possible that a clinic with a 90% cryosurvival rate will warm your eggs and none, or very few, will survive. Even in good laboratories we estimate this happens in 1 - 10% of cases. Second, find out if your clinic runs its own internal frozen egg donor program. Generally speaking, clinics that run their own internal frozen egg donor program are more experienced handling frozen eggs, but this is fairly uncommon. Third, you may want to ask your clinic if they track their success rates with frozen donor eggs, and fresh donor eggs, and how those rates compare. Ideally this would be tracking eggs that they’ve both frozen and thawed, though sometimes you might get information on eggs they’ve just thawed. If you need to use your eggs, you will be undergoing IVF and so you need to ensure your clinic’s laboratory excels at fertilizing eggs using ICSI, growing embryos, performing biopsies on embryos for genetic testing (optional), and freezing and thawing embryos for future use. Below is our chart on what is passable, and what’s exceptional, for each of these crucial steps. Below are the questions we believe you will want to put to your clinic before agreeing to freeze your eggs. If you’ve already frozen your eggs but come to believe your laboratory is not excellent, you can move your frozen eggs. Often the expense is under $1,000 and, if transferred within a city, significantly less. There is a risk some eggs will get damaged but that has been hard to quantify. The only data we have on the subject is from a single clinic that has shown us their data & shows eggs that they froze, or were frozen by others and shipped to them, have roughly similar success rates. Ask your clinic how often they both freeze and warm eggs, and what their oocyte cryosurvival rate is -- 80% is passable, 90% is exceptional. If your clinic has an internal frozen egg donor program, this likely means they have more experience than most clinics freezing and warming eggs.